Start typing below to search for your name or by filling flavour! "Poppyseed, poppyseed - any time." "I am a Masorti -Traditional Jew, therefore, traditionally there is only one type of Oznei HaMan - poppy-seed!" "Well have to say I'm old-fashioned, mine is chocolate!!" "I bake my own "humantasi" (in Romanian) after a recipe of my grandmother and of course I think they are the best in the world. The filling is made of walnuts and honey and no matter the varieties there are on the Israeli market, i stick to these as they remind me of home and of the Romanian Jewish Community i grew up in..."
"My favourites are poppyseed and jam - preferably strawberry jam." 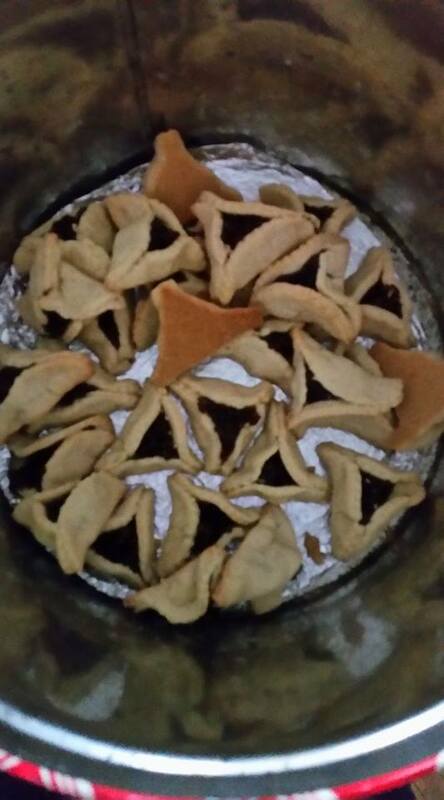 "My favorite 'Oznei Haman' are poppy seeds filling! Covered in powdered sugar!" 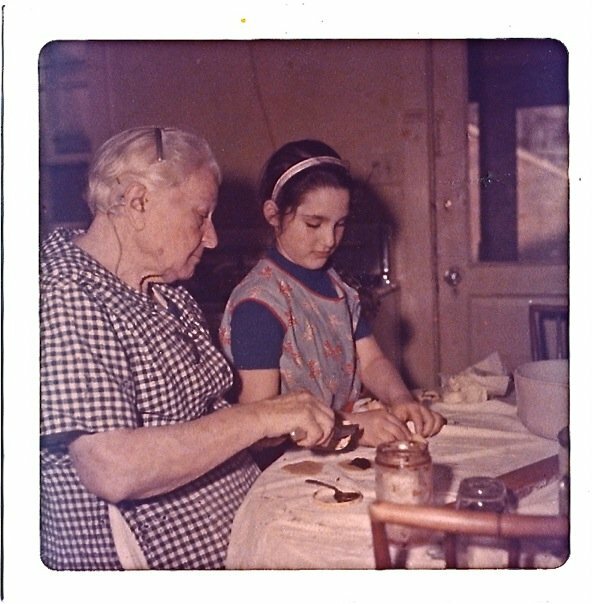 "My grandmother, Mary Nodelman Frankel from Tyvrov, Ukraine, teaching me how to make hamentaschen. She turned a glass upside down and used it as the cookie cutter. Based on the appearance of the sticky-looking jar on the table, I'm guessing that this batch was filled with strawberry preserves, but we also made them with lekvar, apricot, and mohn fillings." "Call me old fashioned, but I always prefer Poppyseed filling. If I'm feeling adventurous I might go for Halva." "I have yet to meet a hamantashen I didn't like." "As a musician most of my Purim revolves around the shows that I am playing over the course of the holiday - so Poppy-seed!" "Any hamantashen from shuk Machane Yehuda, Jerusalem!!!" "I bake Parve and have made apple butter, apricot, apricot riesling, carob hazelnut, cinnamon apple, black cherry, black currant, blueberry, cherry, cherry shiraz, date/walnut, fig, mango, pineapple, plum, poppy seed, prune, raspberry, strawberry and Adama Bomb jelly (hot pepper, vinegar and organic sugar). I am personally fond of fig jam, date, apricot, prune and apple butter." "2017's flavors include Apple Butter, Apple Spice, Apricot, Black Cherry, Date/Apple, Fig, Mandarin Orange, Mango, Mixed Berry, Pineapple, Plum, Prune, and Strawberry/Habanero/Mixed Berry, which isn't leaving the house! "I miss a very very dear friend who is no longer with us. She would make old style Lithuanian hamen tashen with poppy seed filling. As hard as I try I am unable to dublicate this special hamen tashen." Publisher's note: If you haven't heard Shirona's CD, you haven't lived. "Prune only. I’m a classicist." "Our group Kol Hakavod usually buys hamantashen from a group of handicapped people that belong to our kehilá. The filling has strawberry marmalade." "My favourite hamantashen filling is halva! Vanilla or pistachio halva." "I love Oznei Haman with Tamar (dates) which we buy on Rechov Yaffo in Jerusalem. "Gotta go with NUTELLA! The very best filling -- just the right consistency and chocolaty-ness.This year I made Hamantashen Calzones -- pizza dough filled with tomato sauce and cheese but shaped like Hamentashen. Put in Mishloach Manot with a bottle of beer. Chag Sameach!" "My husband and I had our Milk Bar near Balaclava Junction in Caulfield well over 30 years ago. I loved to bake and so I baked for our shop covering many festivals. I used to make Hamentashen from a special pastry consisting of butter, flour, sugar and egg yolks. I filled them with jam and crushed almonds and walnuts; they were a favorite both at home and our shop." 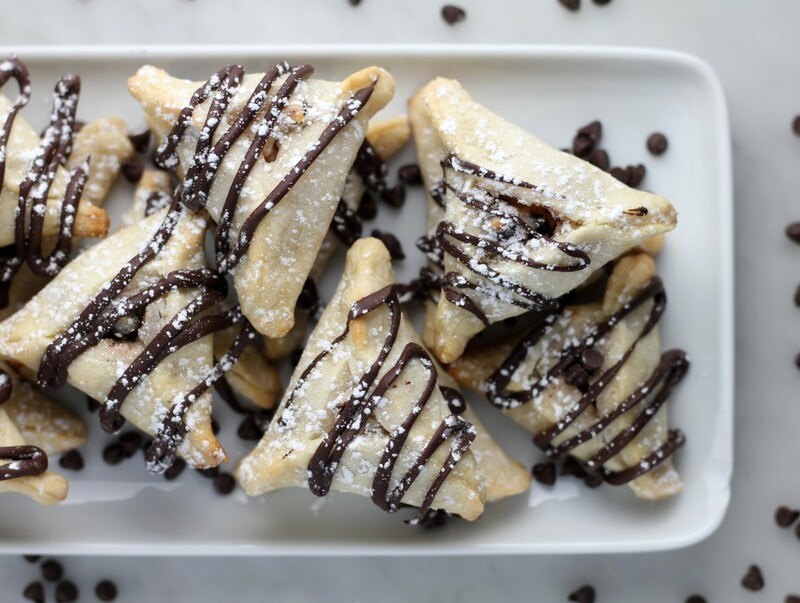 "I’m a chocoholic, so chocolate hamentashen are the only ones for me!" "As someone who grew up feasting on hot jam donuts at the MCG (and Prahran Market) the same goes for my hamantaschen - any red jam filling will do for me. "Mine is apricot, though I'm also partial to prune and raspberry. Poppy seeds, not so much. Happy Holiday!" "My favorite is definitely straight poppyseed. The best!" "Apricot is my favorite, but any fruit filling will do!" "Such memories of joy and unity are reminded through the receiving of strawberry jam hamantashen to start the day's celebrations of Purim at school and further carried on at community school events. Gosh, good hamantashen are a weakness of mine!" "At the Golden Hill Steiner School we made Hamantashens and put rasberries, blueberries and jam in the middle. The children gave them a thumbs up success." "Favourite Hamantasch filling - apricot jam. Best place to acquire one - those baked by my 4-5 year-olds Kindergarteners at Leibler-Yavneh ELC!!" "I bake my own hamentaschen and it seems I have a number of favorite flavors. However, at the top of the list is my Nutella variety. This year I made peach for the first time and loved it! Other favorites include apricot and raspberry, and a nutella raspberry combination." "My new favourite is Cannoli. (Cannoli is an Italian pastry with a ricotta based filling - the filling tastes fantastic in hamantashen!)" "The old old traditional poppyseed." "I love Hamantashen. Especially chocolate!" "My fave is custard filling. But something which would be great to try is this! "My favourite is chocolate, of course!" "My grandmother was s magnificent cook of all pastries. She never measured anything. Every year, she started making hamentashen a few weeks before Purim so she could give all her good friends a large box filled with them. She made the best poppy seed hamentashen. 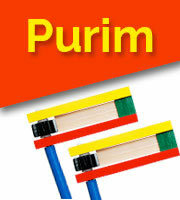 I can still taste them when I think of Purim even though it's 25 years since she passed away." "I bake my own hamantash and I use apricot, prune or poppy seed filling. I use SOLO filling - it's ready made and wonderful. If by any chance I do not bake I can always buy them in the supermarket - Giant, Safeway or BJ'S. I usually bake as my grandchildren love hamantashen!" "I have been baking my own hamantaschen for years. The batches I made were apricot, poppy seed and prune butter. By far the most popular in my house was the prune butter, and I've been making them since. Probably about 35 years!" "I go for the poppy seed and the apricot. 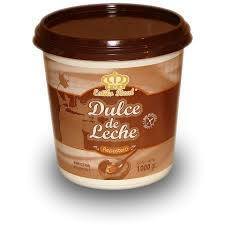 But ask me again next year after I try the dulce de leche ones I've been reading about on your page! My fondest memories of childhood has always been all dressed up waiting for the Purim feast. That was the one meal when nothing was off the limits any food any nosh we were allowed to eat. 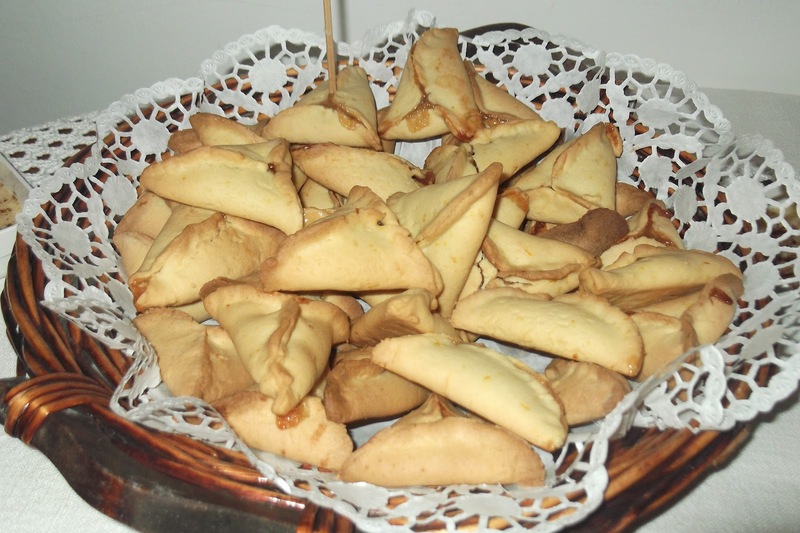 I recall once having some delightful guest at the Purim dinner and they brought this magnificent tray of freshly baked chocolate filled and chocolate coated hamantaschen. I can still taste the chocolate oozing out. As I took that bite, my mum with a twinkle in her eye gave me this smile and said "Moish aren't they yum!!! " "I like them all equally- no favorites! Bring them on!" "I make my own: Dates which I cook over very low flame to soften them then lots and lots of nuts - pistachio, almonds and/or macadamia nuts. Yum!" "My favourites are strawberry jam and poppy seed! Yum!" "Mine is poppyseed all the way. Hands down." "For me it has to be mohn (poppyseed in Yiddish): melt-in-the-mouth short crust pastry with that luscious filling. For a healthy bit of diversity I add a handful of cacao nibs to the 2nd half of the mohn mix. "Shlomi and the kids make the Oznei Haman in our house and they are all delicious, but the Nutella and the poppy seed ones (made by little hands) are just a touch better! "My favorite flavors are the ordinary chocolate and poppyseed fillings." 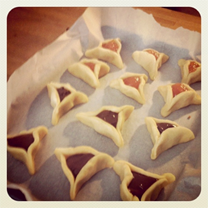 "At Purim, I like to have poppy seeds coming out of my pipik... all from the hamentashen...."
"Nutella or lemon. Just the smell of them being made, bring all the kids to the kitchen! Making them brings the family together and the story of why we eat them being told. There is also a funchetti one with cheese cake filling and a savory one with egg filling." "I make my own hamentashen. I make 2 different kinds; my husband likes fruit-filled ones, made with dried apricots and prunes, while my 2 sons and I like poppyseed filling. I buy the filling, which is very yummy, from my local kosher bakery. My daughter doesn't like hamentashen, period." "I make my own prune and walnut filling for the hamantaschen. I follow Evelyn Rose's recipe. This year my son asked for chocolate hamantaschens so I bought some Nutella to try." "Prune is my favourite filling. I have fond memories at 7 years, folding the dough around the filling with my mother and baking it just enough to get that chewy yet crisp bite. Ah so sweet!" I bake my own. I use my grandmother's recipe (she was a Yerushalmit born in 1890, so when I say it's a very old recipe, trust me, it's a very old recipe...). 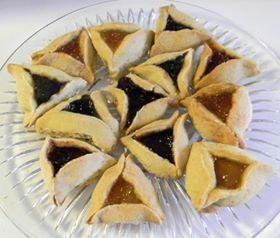 They are very different from all other hamantashen that I've had." "I like my “Oznei Hamman” with black grapes. My mother in law used to make them." "The photo is Mom's 2017 hamantashen with mixed fruit filling. Two weeks before Purim, she had to lock the cookie tin. Had to save some for actual Purim! She makes several batches. Has to, because my dad and I will eat through 30 of them without a problem. She makes the filling with dates, figs, or prunes and also some marmalade and orange juice. She makes the dough thinner than what usually you see at a kosher bakery. I love to see what other people are doing all over the world. I was just talking to my Mother about it and she and I were kind of curious about how some of the different filling recipes came from. We came to the conclusion that families came to a new area and took advantage of what was available locally. Nuts and honey filling, etc." "I used to be a chef and made them primarily with poppy seed, prune, and cheese. I made them with Danish Pastry and cookie dough." My wife likes the: prune ones. Me: Poppyseed and chocolate. I am a chocolate fanatic, and seek out scientific proofs that it is healthy!" "I love the poppyseed ones!" "I'm a traditionalist I still love Pereg (poppyseed )....Though apricot is not bad either!" Cheese and poppy seeds - very traditional. "My favourite is poppyseed and prunes"
"I like poppyseed the best! We usually eat with poppyseeds in Latvia"
"My favourite is Pereg (poppyseed)." "My favourite fillings tend to always be sweet, like a plum or a fig filling, but I guess its different for everyone and we are only limited by our imagination. My childhood memories were of Mum making hamentashen selections including ones filled with cheese and cinnamon, or plum jam, or potato and onion." "My favourite is chocolate with Nutella! Good for dancing!" "Poppyseed. I want to split them open and eat the poppy seed out of each of them!" "My favourite are strawberry marmalade and also chocolate ones!" "Mohn (poppy seed) all the way! "My favourite flavours are walnut and honey or strawberry jam." "Poppyseed, I'm crazy about poppyseed." "I love anything with chocolate so....chocolate it has to be!" "My favourites: Dates & chocolate of course!" "My favourite is old fashioned poppy seed in a Danish pastry." "My Great Aunt Dorthy's poppy hamantachen for sure! She would make large, yeast dough, with dry poppy and send by mail to all the family. Poppy is still , by far my favorite." "Hands down my favorite is prune. 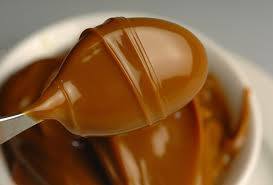 The filling is called Lekvar Prune Butter." Art Feinman, Melbourne, Australia, ex-USA"
" Good old strawberry jam!" " I love poppy and raspberry." "My favorite is dulce de leche (sweet Argentine invention)"
"My favorite kind is the kind that my wife, Sharon, makes: lovely pastry, with apricot filling. They are fantastic." "Pereg - poppyseed. That is the real thing. The original ozen haman!" "Prune, apricot, raspberry and of course chocolate. Prune/apricot and apricot/raspberry combinations are also good."